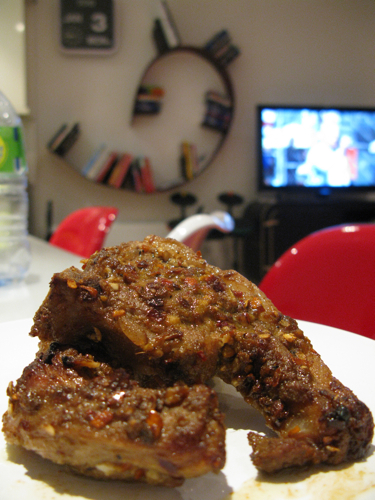 If there was one thing I didn’t do enough in 2010, it was trying my hand at new cuisines at home. It’s not that I didn’t do any home-cooking at all last year. But in the 2 or 3 times a week that I did cook something up, out of sheer convenience and laziness, it was always staple favourites that I had made time and time again. So here is one resolution I do intend on keeping for 2011: At least once a month, I will cook up something that I have never cooked up before. And on that note, here’s a little something inspired by Gourmet San‘s XinJiang Lamb Skewers, adapted from this recipe I found online. As China’s North-Westernmost province (bordering Mongolia, Russia, Kazakhstan, Pakistan and India amongst others), the food of XinJiang often has curious elements of both Indian and Middle Eastern cuisine. I find the use of cumin in this dish particularly refreshing as its definitely not a spice associated with Chinese food. For ease, I used lamb-chops instead of the more traditional skewered Shoulder meat. Put all the Spice Rub ingredients (except the Oil and lemon juice) into a pestle and mortar and pound into a dry paste for 2 -3 minutes, releasing the flavours from the Szechuan peppercorns, garlic and ginger into the rest of the ground spices. Add the oil and lemon juice towards the end, then mix for a further minute into a wet paste. Coat the lamb generously with the spice rub, and leave to marinate for at least 4 hours (preferably overnight). Pop into a pre-heated 200°C/180°C (fan assis.) oven for 30 minutes for Medium-rare (add a further 5-10 minutes if you like your meat more well done). If you are cooking skewers instead, 20-25 minutes should suffice. these look pretty awesome… i have a whole tub of szechuan pepper corns that need to be put to good use! Mr. Foodie: Ever since tasting the Xinjiang Lamb skewers at My Old Place/Gourmet San, I’ve often get these sudden cravings for it. Was surprisingly simple to make actually – i think you’ll find most things are actually store cupboard/pantry ingredients. Let me know how it goes if you cook it! Lee Eng: Trying to cook up cook up new things this year so this should be the first of many. Also been wanting to revamp the blog’s look for some time now as got a bit bored of the other – glad i finally got round to doing it – its a little more interactive than previously!